Unfortunately this product was very noisy and jumped around on the spin cycle. I chose this machine for the quick wash 14 mins, but you could only put 1.5kg of clothes in it. No good for busy family. Very complicated instructions for washes to. Not only is this a very energy efficient item, it is very easy to operate. But the main thing for me is just how quiet this machine is whilst in use. I am very impressed. Just to note that the one touch function doesn’t work with anything other than android. That said I didn’t buy this machine to connect my phone to it. It has a good range of programmes, it spins well, it’s quiet and it’s all good so far. Love the large door for easy loading. Plenty of options to choose the right type of wash programme for the type of fabric but not too many to make things complicated. 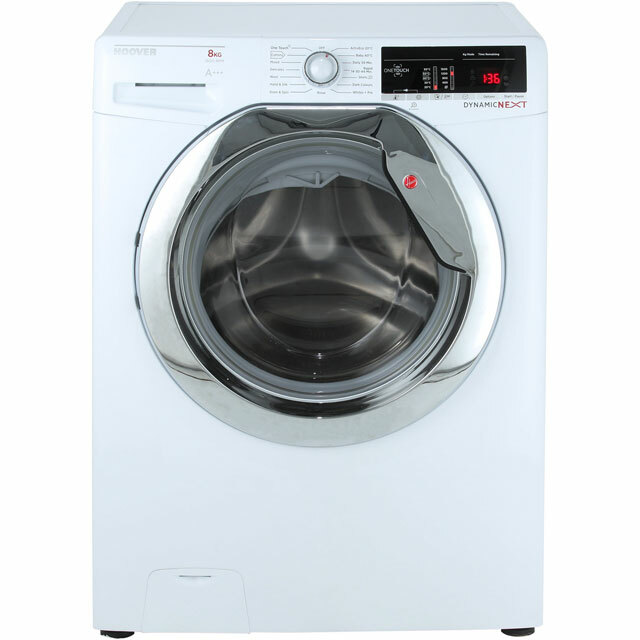 My favourite wash is the Eco wash at 20C, which still washes clothes well. Have owned the machine for approx. 6 weeks and not found anything to dislike so far. My previous machine was also a Hoover and lasted years so wanted to purchase the same brand. Was particularly interested in using the android app but so far have not explored this. Whilst having no reason so far to badly judge the performance of the washer - the instructions need to be made plainer. Particularly when choosing the 3 basic washes.........you should plainly state that H01 is the smallest wash and so forth so that the right programme can easily be chosen.........Maybe this is clear to others but to my 81 year old Mum it certainly was NOT!!!!!!! On the plus side it seems to work well once going but we have only had the machine a week.....Looks very nice, too.